Flow cytometric analysis of Jurkat cells, untreated (blue) or treated with Etoposide (25uM, ON; green) using Cleaved Caspase-8 (Asp391) (18C8) Rabbit mAb (PE Conjugate) (solid lines) or concentration-matched Rabbit (DA1E) mAb IgG XP® Isotype Control (PE Conjugate) #5742 (dashed lines). Cleaved Caspase-8 (Asp391) (18C8) Rabbit mAb (PE Conjugate) recognizes human caspase-8 when cleaved at Asp391 (isoform A, Asp374 on isoform B). This antibody detects cleavage products containing the pro-domain with the p18 subunit, as well as the p18 subunit alone. Monoclonal antibody is produced by immunizing animals with a synthetic peptide corresponding to residues adjacent to Asp391 of human caspase-8 protein. This Cell Signaling Technology antibody is conjugated to phycoerythrin (PE) and tested in-house for direct flow cytometry analysis in human cells. The antibody is expected to exhibit the same species cross-reactivity as the unconjugated Cleaved Caspase-8 (Asp391) (18C8) Rabbit mAb #9496. Apoptosis induced through the CD95 receptor (Fas/APO-1) and tumor necrosis factor receptor 1 (TNFR1) activates caspase-8 and leads to the release of the caspase-8 active fragments, p18 and p10 (1-3). 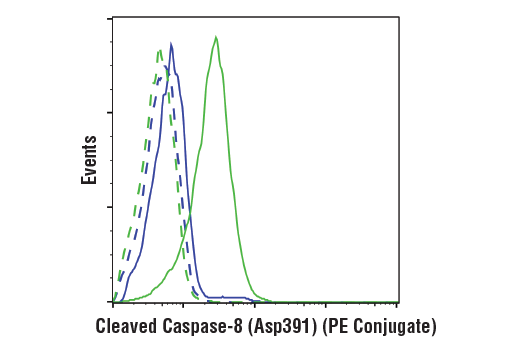 Activated caspase-8 cleaves and activates downstream effector caspases such as caspase-1, -3, -6, and -7. Caspase-3 ultimately elicits the morphological hallmarks of apoptosis, including DNA fragmentation and cell shrinkage. Muzio, M. et al. (1996) Cell 85, 817-27. Boldin, M.P. et al. (1996) Cell 85, 803-15. Fernandes-Alnemri, T. et al. (1996) Proc Natl Acad Sci U S A 93, 7464-9.